Originally published in The American Prospect on November 30, 2016. On November 8, Massachusetts residents went to the polls not only to cast their vote for president but also to weigh in on a hotly debated question regarding charter schools. The ballot initiative—which proposed lifting the state’s cap to allow establishing up to 12 new charters or expanding existing charters annually—had generated a heated battle for months, with voters inundated by mailings and advertising from both sides. About $34 million was spent on these efforts, making them easily the most expensive ballot initiative campaign in state history. Teacher unions provided nearly all the money to fight the measure, while out-of-state donors and Boston’s business community shelled out most of the money in support. The debate mostly went like this: Supporters of the ballot measure, known as Question 2, argued that charter schools in Boston have proven extremely effective for disadvantaged students. They pointed to research studies that show students who attended Boston charter schools, compared to students in Boston’s traditional public schools, were more likely to graduate high school in five years, more likely to attend and complete college, and less likely to enroll in remedial education. In addition, researchers found attending Boston charters led to significant gains in state tests, AP tests, and the SAT. Supporters of charter expansion also pointed to long charter school waiting lists as evidence that families, especially poor families, desperately seek better school options. If the ballot measure failed, proponents insisted, it would be because wealthy white suburbanites were too selfish, or short-sighted, to let low-income African-Americans escape their failing public schools. Polls conducted throughout the campaign did reveal higher support for charter school expansion among black and Latino voters. Critics of the charter school ballot initiative challenged the legitimacy of the waitlist figures that supporters wielded—pointing to evidence that the stats were substantially inflated. Critics also pointed out that the research on charter school effectiveness was dramatically less impressive outside of Boston, and this statewide ballot measure would impact schooling all over Massachusetts. But the most salient argument critics levied—and one that Question 2 supporters never figured out how to overcome—was that the ballot measure might expand opportunity for some students, but would ultimately drain money and resources from those students who remained in traditional public schools. Supporters tended to dismiss these concerns, saying that per-pupil dollars would “follow the child” so there would be no real negative impact on other students who didn’t attend charters. But a number of experts, including Boston’s chief financial officer, said the fiscal strain would be tremendous. This became the rallying point for Question 2 opponents—and the primary reason the ballot measure failed 62 percent to 38 percent, with cities all over the state, including Boston, voting in opposition. Throughout the campaign, many Massachusetts voters said that they found the news coverage confusing. Someone would make an argument, a new report would come out claiming the opposite, so-called experts would go back and forth about it, and the media would often do little more than cover the “he says, she says” discussion—leaving residents unsure of what the truth really was. Today, the Economic Policy Institute is publishing a report by Bruce Baker, a national expert in state school finance, charter schools, and teacher and administrator labor markets, that he hopes will help improve the level of public discourse the next time residents and political leaders are asked to make such high-stakes education decisions. Baker’s report looks at the fiscal impact of charter school expansion—an area that has received surprisingly little academic attention, despite the charter sector’s 25-year existence, and the growing public awareness that this is a critical issue to understand. I covered the topic back in June, and at the time the only real research study available on the issue was one published in 2014 that documented the negative fiscal impacts that traditional public schools in Buffalo and Albany had experienced from charter schools proliferating. Since then, David Arsen, an education policy professor, published research finding that the biggest drivers of fiscal distress across Michigan school districts were declining enrollment and revenue loss, particularly where school choice and charters were most prevalent. Moody’s Investor Service, a bond credit rating agency, has also been sounding the alarm about the severe financial distress a growing number of school districts face as charter schools expand. For Baker, the debate over whether charter schools are seen as good or bad was for a very long time “one-dimensional”—based on whether charters produced marginal increases or decreases in students’ standardized test scores. The debate over whether to lift Massachusetts’ charter school cap, Baker says, was more “two-dimensional,” in that people talked about both academic impacts and some fiscal tradeoffs. But still, the parameters of the fiscal conversation were limited, and Baker says he hopes his new report will provide a framework for a more “multi-dimensional” discussion of tradeoffs going forward. So what does a multi-dimensional discussion look like? Baker suggests moving the conversation away from the individualistic, consumer-choice narrative that market-driven reformers have promoted over the past two decades, and towards one that centers public education as a collective responsibility for communities to provide as efficiently, and equitably, as they can. In an interview with the Prospect, Baker emphasizes that we need a far better understanding of all the costs and benefits associated with running multiple, competing school systems in a given space—public policy questions that are surprisingly ignored on a regular basis. He cites transportation costs as one example that rarely gets attention when leaders decide whether or not to open more charter schools. Baker says that before leaders decide to open new charter schools, they should take into account the inefficiencies created from having multiple transportation systems, duplicative administrative overhead costs, additional financing fees associated with alternative capital investments, and any transition costs that arise from creating new school systems. Baker wants to see leaders wrestle with whether it’s possible to achieve comparable gains by investing in programs and services in existing public schools. Do the gains of charter expansion outweigh the costs? Is it possible to design a more equitable and efficient system by other means? Economic Policy Institute president Larry Mishel says he hopes this report will lead to greater attention paid to the impacts of unbridled charter school expansion, especially under Donald Trump’s presidency. Originally published in The American Prospect on June 6, 2016. Last month, a teachers union-funded study in Los Angeles sparked a furor when it reported that the city’s charter sector—which educates 16 percent of L.A.’s public school students—drains upwards of $500 million a year from the district’s school budget. Such school budget fights are not just happening in Los Angeles. In cities all over the country—from Massachusetts, to Missouri, from Florida to Pennsylvania, from Washington state to Maryland—charters and local school districts are clashing fiercely over who gets what funding. Districts say charters steal their money, leaving them unable to properly educate the students who remain at their schools—very often those who are the most expensive to educate, like children with disabilities. Charter advocates counter that districts’ financial woes began long before charters came on the scene, and students who seek alternatives shouldn’t have to suffer just because districts and unions face budget and organizational crises. Money should “follow the child” school choice supporters say, meaning per-pupil tax dollars should be directed towards whichever school system a student wishes to attend. Charter school policy discussions often devolve into political battles that pit advocates armed with competing research studies against one another in arguments over academic impact. In some cities, like Boston and New Orleans, students attending charter schools have demonstrated significant test score gains. In others, the academic results have been no better than those in traditional public schools. And in some cases, charters have yielded worse results than the district schools. The research examining charter schools’ academic effectiveness will continue indefinitely, but it is concerns about their fiscal impact that are becoming increasingly charged. As the pressure to expand charter schools continues to mount, and the budgetary health of local districts continues to decline, teachers, administrators, parents, and activists on both sides of the charter school divide are facing off over a dwindling resource: money. Intensifying the heated political clash between charter schools and traditional school districts is that overall spending on public education, for all schools, has fallen. In 2015, the Center on Budget and Policy Priorities, a progressive think tank, found most states provide less financial support for public schools than they did before the Great Recession, and in some cases, much less. “Even as we’ve come out of the recession, heels are dug in, and nobody is really considering putting in additional funds,” says Bruce Baker, an expert on school finance. Funds are not only shrinking, but districts are hard pressed to manage costs that are “fixed” or “stranded” when students leave to attend charter schools, experts warn. Charter advocates say that as money follows the child, districts should figure out how to adjust to new fiscal realities. But it’s not always so easy to reduce certain expenses, at least right away, say researchers who have studied education funding. The cost of heating a building, for example, is the same for a classroom of 15 students as it would be for one of 18 students. Similarly, a district that has lost only a few students from each grade can find it difficult to reduce the number of school employees. In 2013, Moody’s Investor Service, a bond credit rating agency, released a report which concluded that a small but growing number of school districts face severe financial stress as charter schools proliferate, specifically because these districts can’t reduce their costs as quickly as they lose revenue. This has forced already struggling districts to make further cuts to programs and services, and in some cases, to shut down schools entirely. Still, given that research shows money matters a great deal in education, many charter critics believe it is neither wise nor ethical to gamble that cost cuts will wind up improving student learning. Still other academics suggest tight budgets may actually help boost student achievement. Ron Zimmer, an education researcher at Vanderbilt University, has said it’s possible that fiscal strain on district budgets could spur competition, potentially helping all students. Still, given that research shows money matters a great deal in education, many charter critics believe it is neither wise nor ethical to gamble that cost cuts will wind up improving student learning. When the charter school expansion first started to take off, some states freed up transitional funds to help school districts cope with declining enrollments and fiscal fallout as students left for charters. Such transitional aid began “as a sort of compromise” between charters and district schools says Reback. Yet many of these compromise measures were reduced or eliminated once the recession hit. For example, in Illinois, state law once provided a three-year, declining payment to districts to help them manage their budgets as charter enrollment grew. According to Kasia Kalata, the external affairs manager at the Illinois Network of Charter Schools, the state offered impact aid to support school districts with declining enrollments, but phased out the policy in 2009. Similarly, in 2007, Michigan began to provide some categorical funding to districts with declining enrollments. But these allocations were never fully funded, and by 2012, the state eliminated them altogether. Michigan also lifted its charter school cap in 2011, leading to rapid charter growth. “Right now you could open a charter school, for almost any reason, in any location, regardless of what that will do to district schools,” says Peter Joseph Hammer, a law professor at Wayne State University in Detroit. He says Michigan’s charter law, and the elimination of the state’s charter cap, has just been “devastating” to traditional public school finances. While the categorical grants that Michigan once offered provided some help, Hammer says even those measures were always “very small relative to the need” and mostly enacted to quiet critics. Pennsylvania used to reimburse local districts up to 30 percent of their charter school costs, but in 2011, the state’s Republican governor eliminated these partial reimbursements. This was a loss of more than $240 million across the state, including over $110 million for Philadelphia alone. Laws governing pension participation for charter school employees vary from state to state. Charters, though, have generally not been around long enough to accumulate their own unfunded pension liabilities. The question now is: do charters share responsibility to help pay down the pension legacy costs of area school districts? Not everyone agrees. Such academics as Marguerite Roza and Jon Fullerton say that policies designed to help districts cope with the effects of shifting student enrollments “weaken the incentives that should drive change and adaptation.” Roza and Fullerton question the idea that schools have all these “fixed costs,” and argue that districts should think more seriously about cheaper alternatives like online schooling, defined-contribution plans, and modified tenure systems. Only by “adopting more nimble expenditure structures,” they have written, can districts feasibly adapt to a changing landscape. Other “fixed costs” that tend to receive far less attention in conversations about the fiscal impact of charters are the billions of dollars owed by states and districts in pension obligations—and what effect the expansion of charter schools means for local districts saddled with these payments. Unfunded pension liabilities are the estimated value of benefits earned by employees minus the assets set aside to pay them. Unfunded liabilities can arise because required contributions have not been made in full, or because actuarial assumptions have not been met. States and districts with large unfunded liabilities are now scrambling to find the dollars to pay up, resulting in painful cuts in other areas, including salary reductions for current teachers. While some unfunded pension liabilities are due to market fluctuations, including sharp stock market declines in 2002 and 2008, leading economists say the most severe cases are due to politicians’ failure to keep up with employers’ share of pension payments over many years (most public-sector workers also contribute toward their own pensions). Instead of setting aside money for future retirees, political leaders opted to defer their responsibilities, borrowing against the next generation of public school students and taxpayers. Though some education reform advocates have dismissed the idea that districts can’t sufficiently downsize when students leave for charters—they chalk the problem up to bureaucratic recalcitrance—many people acknowledge that such expenses as pension commitments simply cannot be scaled back when student enrollment shifts. “Lifetime health benefits and defined-benefit pensions, sometimes guaranteed decades ago, have created ongoing costs for districts that are unconnected to revenues and enrollment and cannot be easily reduced,” Roza and Fullerton write. Some charter operators have begun to explore how they might extricate themselves from their state pension plans. “Charter schools are a cash cow for the pension plans, and once you’re in, it can be hard to get out—which is what a lot of operators face now,” says Podgursky. “As the costs are going up and up and up, many are saying ‘hey, we want out of here’—though generally escaping is hard.” In an effort to avoid adverse selection, pension plans do not typically allow individual schools to opt out. As a result, some charter operators are turning to the courts. In 2013, charters in Georgia argued to the state supreme court that they shouldn’t be responsible to help pay down debt they didn’t create. Georgia’s high court agreed, and ruled that charters cannot be asked to share in the burden of paying down unfunded pension liabilities. To complicate things still further, the question of whether charter employees should be eligible to participate in state pension plans remains unsettled. “They’re private employees for some things, like collective bargaining, but public for other things, like pensions,” notes Podgursky. Since 2011, the Internal Revenue Service and the Treasury Department have been scrutinizing this issue, and working to determine whether private charter teachers are “governmental” enough to participate in state plans. Asked to check on the status of this guidance, the IRS told The American Prospect that, five years later, it still has not been finalized. For districts saddled with pension payments, the consequences can be severe. “If the total payroll of the pension plan is slower than expected, by virtue of slow growth in the number of employees or slower growth in salaries, then there are fewer dollars available to fund the plan,” explains Brainard. Essentially, if charter schools do not participate in their state plan, either by not contributing to it as employees or not helping to pay down legacy costs, then there are fewer available dollars to pay down existing debts—obligations that cannot be “downsized” through layoffs or school closures. In the absence of increased state and federal funding, tense battles over school spending are likely to be handled in piecemeal—and controversial—fashion. In 2015, for example, the Philadelphia School Partnership, a local philanthropic education reform group, offered to pay the Philadelphia School District $25 million in order to take the issue of stranded costs “off the table.” Partnership leaders wanted to push for more charter schools, without having to contend with school district worries about their fiscal impact. But the school district said the group’s offer was too low—generous, but insufficient to cover the yearly stranded costs they’d bear if more students were to leave for charters. Local advocates also protested the organization’s offer on democratic grounds. “It would be a terrible mistake to take the money,” Susan Gobreski, the former executive director of the Education Voters of PA, told Newsworks at the time. “We cannot let benefactors make decisions like that. I’m very concerned about how much pressure is being put on the district to make decisions that are not in the best interest of the district or most of the kids in Philadelphia, and certainly not in the interest of Philadelphia as a community. This is ideology gone wild. Tensions surrounding funding for the charter and traditional public school systems are not going away, and indeed are likely to grow more serious over time. While Bifulco and Reback offer some policy suggestions for ways to help mitigate financial stress as charter schools expand—such as constraining when students may enroll in charters in order to help districts plan their budgets more systematically—right now ideological divisions have left the two sectors at a stalemate. Charters market themselves as ways to “escape” failed school districts, touting their autonomy and independence. Traditional school districts resent charters for wooing away their students, and now fear charters are hollowing out their budgets. The bitter divide between education sectors has blocked cooperation and solutions. As the bickering over money continues, more and more public school students will likely cram into overcrowded classrooms, studying in schools without basic resources like textbooks, computers, teachers, and guidance counselors. With fewer and fewer dollars to go around, the price for policymakers’ impasse will invariably be paid by students. Originally published on The American Prospect’s Tapped blog on September 11, 2015. Last spring, officials from the Philadelphia School District announced plans to contract out substitute-teaching services, saying they could not effectively manage the responsibilities in-house. At the time, approximately 60 percent of substitute teaching jobs were filled daily, and officials said a private vendor would be able to fill more open positions. Naomi Wyatt, the chief talent officer for Philly public schools, said they paid more than $18.6 million annually for substitute teaching expenses, including reimbursement costs for traditional teachers who fill in when subs cannot be found. The announcement effectively meant that the district would seek to use non-unionized substitute teachers that they could pay at “market-rate.” It eventually hired Source4Teachers, a New Jersey-based company that provides schools with substitute teachers, substitute paraprofessionals, and substitute support staff. The company works in nearly 200 districts throughout the U.S. and dozens locally, but Philadelphia School District is its largest client. Though the cash-strapped urban district denied they were contracting out to save costs, the pay differences for substitutes between last year and this year are substantial. Source4Teachers pays between $75 and $90 per day for uncertified substitutes, and $90 to $110 for credentialed ones. By contrast, the district had paid $126.76 for uncertified substitutes, and $160.10 for credentialed ones. The biggest difference is for retired substitutes: the district had paid retired subs up to $242 daily, depending on their educational degrees and college credits; under Source4Teachers, retired educators receive the same rate of pay as all other teachers. The new academic school year started this week, and The Inquirer reported today that Source4Teachers is off to an embarrassing start. On the first day of school, it had filled only 11 percent of open substitute teaching positions, which meant 477 city classrooms did not have teachers. The rate and number of vacancies were roughly the same on Wednesday and Thursday, too. Owen Murphy, a spokesperson for Source4Teachers, said they hope their “learning curve will soon go away” and that they will produce more teachers fast. So far, the firm has just 300 workers credentialed and ready to take on substitute teaching jobs, but Murphy says hundreds more are currently in the midst of applying. He also said he expected far more substitutes who worked for the district last year to apply to work with Source4Teachers, but so far that hasn’t happened. They hope to eventually have a pool of 5,000 substitutes ready to call on for work. Wyatt said that other big urban districts like Baltimore, Cleveland, and Detroit also outsource substitute-teaching services. The president of the Philadelphia Federation of Teachers, Jerry Jordan, suggested that district officials intentionally manufactured a substitute teaching shortage in order to outsource the jobs. He referenced a 2012 Boston Consulting Group report that recommended privatizing the positions. Jordan told The Notebook, a non-profit education news site in Philadelphia, that he knew of qualified substitute teachers who were not called in to work. A New Course: Larry Hogan wants to change Maryland’s unique charter school laws and bring in more charters, but will kids suffer? 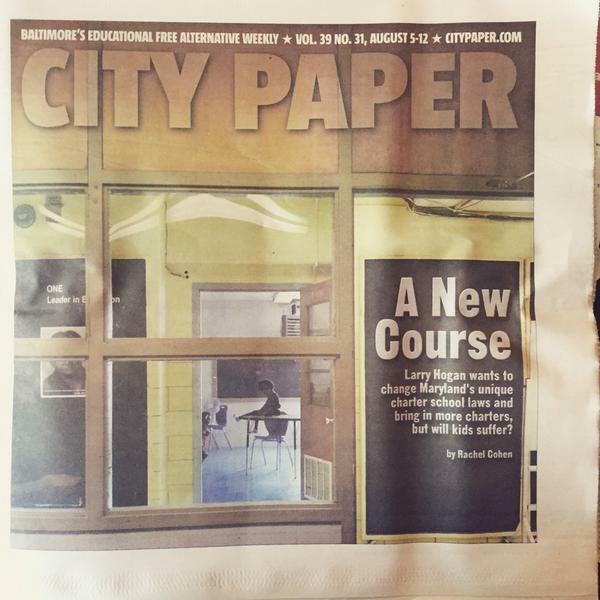 Originally published in Baltimore City Paper on August 5th, 2015. “We shouldn’t be last in the nation in charter schools,” Hogan declared—referring to Maryland’s spot in the state ranking system designed by the National Alliance for Public Charter Schools (NAPCS), an advocacy organization that promotes charter schools around the country. According to NAPCS, Maryland has the nation’s “worst” charter law. The Baltimore Sun editorial board, echoing NAPCS, has said Maryland boasts one of the “weakest” charter laws in the United States. The Maryland Charter School Act passed in 2003 and the first state charter schools opened their doors in 2005. A decade later roughly 18,000 students attend 47 Maryland charters—34 of them concentrated in Baltimore City. A version of the Public Charter School Improvement Act eventually passed, but it was substantially watered down from Hogan’s original proposal, and many believe he’ll push a stronger law again next year. The heart of the debate centers on competing visions for the future of public education, and whether one believes Maryland has the best charter law in the country or the worst. The publicly funded but independently managed schools known as charters have grown significantly since the first one opened in Minnesota 23 years ago. Today more than 6,700 charters exist in 42 states and Washington, D.C. and their numbers are climbing. Albert Shanker, then-president of the American Federation of Teachers (AFT), first proposed the charter school idea in 1988; the influential union leader imagined a new kind of school that could serve as a laboratory for innovative and experimental education practices. The hope was not only to serve kids within charters who might benefit from alternative educational models, but also to carry newly discovered best practices back into traditional schools for all students to enjoy. In Shanker’s vision, charter teachers would still be unionized district employees, but certain labor regulations would be relaxed to promote greater innovation. Maryland’s charter culture sets it apart from most other states in several ways. First, under the law all Maryland charter teachers are considered public school employees and represented under their district-wide collective bargaining unit. While this actually most closely resembles what Shanker had imagined, few states today adopt this particular model. According to the Center for Education Reform (CER), just 7 percent of all charter school teachers nationwide are unionized. Another distinctive characteristic of Maryland charters has been a general commitment to innovate within the district, as opposed to outside of it. In other states, the law may allow for multiple charter authorizers, such as churches, universities, or nonprofits. In Maryland, however, only the local school board can authorize charter schools. “I’d say the strong desire [of Maryland charters] to work within the school district is fairly unique,” says Joceyln Kehl of the Maryland Alliance of Public Charter Schools, a newly formed coalition of charter operators around the state. “Maryland is hugely pro-union and Democratic, so that’s just our context,” she adds. A stronger level of oversight, a close relationship with the school district, and unionized charter teachers illustrate the uniqueness of Old Line State charters. The vast majority of schools are considered “mom and pop” charters, meaning parents or former local educators founded them, as opposed to some of the larger national charter management organizations (CMOs) that have developed presences in other cities. According to an Abell Foundation report released this year, many high-performing CMOs have expressed reticence or disinterest in coming to Maryland given the conditions in which they’d have to operate. While the Maryland charter law has facilitated the growth of strong schools with little to no fiscal and academic issues, the question is whether such growth is sufficient, and whether the state’s law should change in order to entice more CMOs to expand into Maryland. Baltimore’s 34 charter schools educate 13,000 of the district’s 84,000 students. Bobbi Macdonald, co- founder of the City Neighbors Charter School, is one of Charm City’s veteran operators. City Neighbors was one of the first charters to open up in 2005, and since then Macdonald has opened two more schools. Reflecting on the evolving dynamics between Baltimore charter operators and the district, Macdonald describes years of intentional relationship building. “I don’t believe that school systems are made out of steel, they’re made out of people,” she says. In 2004, after the charter law passed and before the first schools opened, Baltimore’s new charter operators formed a coalition to organize and advocate for their collective interests. This coalition grew increasingly formalized as the years went on. “The work of the coalition became really focused on defending our autonomy and the rights of children in charter schools,” says Macdonald, who served as the coalition’s co-chair for the first six years. Many charter operators spoke favorably, even nostalgically, of Dr. Andrés Alonso’s six-year tenure as city superintendent, which ended at the end of 2012-2013 academic year. “Dr. Alonso had a clear vision of wanting to provide a portfolio of school options for families, and to create opportunities for innovation and then replicate those practices,” says Allison Shecter, the founder of the Baltimore Montessori Public Charter School, one of the city’s most popular charters. “I think when Dr. Alonso was here we had a really strong relationship and participated in a lot of ways on many different levels,” says Macdonald. Since Alonso’s departure, the relationship between charter operators and the district has grown more strained. “I’d say it’s a challenging relationship. It’s not a partnership unfortunately,” Shecter says. “We’d like it to be a partnership but in order for it to be a partnership there needs to be consistent and ongoing communication back and forth around policies that may impact charters.” Many operators say they feel the district is neither accountable nor transparent, which fuels growing levels of distrust. One issue charter operators repeatedly raise is that they believe the district short-changes them when it comes to per-pupil funding. Under state law, the district must provide “commensurate” funding between traditional schools and charters. Currently, the district allocates $7,300 per traditional school student, and $9,400 per charter student—which is supposed to take into account that Maryland charters have to pay for the cost of their facilities, programming, salaries, and other school-level costs, which the district pays for in traditional schools. However, the formula that the district uses to come up with these amounts is unclear, and operators are convinced that what they’re getting is too low. Charter operators believe that they should be getting closer to $14,000 per pupil. Debates around these dollar amounts grow very charged. Not everyone at charters agrees the district is shirking its funding responsibilities. “Charters still receive more per pupil, even after those extra costs are covered,” says Matthew Hornbeck, the principal at Hampstead Hill Academy, a charter located just south of Patterson Park. “Everyone, with the exception of some of the charter operators, knows that.” Hornbeck, who has served as his school’s principal for 12 years, has been outspoken about what he sees as a district funding formula that unfairly favors charters. “I was a charter operator and I absolutely knew we were getting more than traditional public schools,” adds Helen Atkinson, the executive director of Teachers’ Democracy Project, a local organization that helps teachers engage in public policy and develop more social justice curricula. Jon McGill, the director of academic affairs for the Baltimore Curriculum Project, the city’s largest charter operator, describes the relationship between charters and the school district headquarters on North Avenue as “overall harmonious” but says he does wish the district would be more transparent about how about how exactly it spends its slice of per-pupil funding. He thinks charters “lose the PR game” because the public sees them as always asking for more money. One reason the funding issues get so heated, McGill suggests, is because some operators have taken huge personal risks to open charter schools, and feel they need more reassurance that the district truly supports their efforts. “Some people have 30-year mortgages to worry about,” he says. While for the past decade the story of Baltimore charters has mostly been an intra-district struggle, Gov. Hogan’s rise to power signified a turning point for the Maryland school-choice movement. The legislation Hogan introduced would have dramatically changed the charter law passed in 2003. His proposals included provisions to exempt charter school employees from the district bargaining unit, as well as from many state and local requirements such as teacher certification. Hogan’s bill would have enabled charter schools to compete against traditional schools for state public construction money, and the bill would have required districts to explicitly define “commensurate funding” to mean that charters should get 98 percent of the per-pupil amount that traditional public school students receive, leaving 2 percent left over for district administrative expenditures. Once news of Hogan’s charter bill went public, Maryland charter teachers began to organize together in new ways. In Baltimore, teachers convened and decided to form the Baltimore Charter School Teacher Coalition. Educators broke up into committees to strategize and implement an organized political response to the bill. Corey Gaber, a sixth-grade literacy teacher at Southwest Baltimore Charter School who was active in the coalition, says part of the reason they formed their group was because they were dissatisfied with the pace and quality of the Baltimore Teachers Union’s (BTU) response. “We felt like we needed to reach out and inform teachers about what was going on and we didn’t feel like the union was doing it effectively,” he says. Gaber acknowledges that among Baltimore charter teachers there exists a “constant contradiction of feelings”—in some ways they are dissatisfied with the current union leadership, but on the other hand, teachers are proud to be being unionized district employees and deeply value their protections. With fellow charter teacher Kristine Sieloff, Gaber wrote an Op-Alt for City Paper (“The injustice of a two-tiered education system in Baltimore City,” March 31) and Gaber created and helped to circulate a petition that garnered hundreds of signatures from both charter and traditional public school teachers. “The interests of traditional teachers in charters and public are exactly the same right now,” says McGill, who thinks the proposed bill would have created deep divisions between Baltimore educators. The BTU helped circulate another petition for charter teachers and charter educational support personnel, roughly 740 people in total, and more than 90 percent of eligible petitioners signed. “I spoke with every teacher I know, teachers were universally against [the legislation],” Gaber says. In addition to local educators who worried about losing their collective bargaining rights and allowing non-certified teachers to work with kids, other leaders pushed back against what they saw as a deeply inequitable funding structure embedded into Hogan’s legislation. Hogan’s legislation said “commensurate funding” should mean that charters get 98 percent of what traditional public schools receive because a 2005 State Board of Education ruling determined that districts needed only 2 percent of per-pupil funding to cover central administrative costs. But when the Department of Legislative Services (DLS) surveyed local school systems later on, it found that administrative expenditures make up closer to 10-14 percent of per-pupil spending. Critics argued that if 98 percent were legally guaranteed for charters, but necessary administrative work still had to be done, then money would be taken from traditional public school students, potentially leading to increased class sizes, special educators with enormous case loads, or cuts to after- school programming, gym, and art. Local charter operators insisted that their goal was not to bankrupt the district, but simply to fight for parity. “We believe strongly that we can achieve this without harming funding for other schools,” testified Ed Rutkowski, the executive director of Patterson Park Public Charter School. The watered-­down bill that Hogan ultimately signed was a grassroots victory for some, and a major disappointment for others. The Center for Education Reform, which hired several lobbyists to push for the bill’s passage, was so dismayed with the final result that it actually urged the governor to veto it, insisting that this would be a step back for Maryland school choice, not one forward. Given that the governor still had support from MarylandCAN, a pro-charter advocacy organization that helped to craft the original legislation, Hogan went ahead and signed the bill into law. It’s an imperfect bill, but it creates “the pathway” to expand charters and it grants more flexibility to existing ones, said Keiffer J. Mitchell Jr., Hogan’s special adviser on charter schools. Whether new legislation will be introduced next year is an open question. Kerwin of CER thinks such an effort would be futile, even if they tried. Todd Reynolds, the political coordinator for Maryland’s American Federation of Teachers, says some legislators might decide it makes sense to wait until after the new MSDE/DLS study is completed. The question of whether some of the larger CMOs would be interested in setting up schools in Maryland remains uncertain. Kehl says it’s important to help facilitate more attractive operating conditions because “there’s a certain point where you tap out your local leadership” and if you “can’t attract national talent” into Maryland, then you’ve just closed the door on quality options for kids. Others see luring CMOs as a less urgent priority, especially given how the state increasingly underfunds public education. In his latest budget, Hogan increased state education funding by 0.4 percent, but cut Baltimore City’s funding by 3.3 percent. Attracting those CMOs—which would likely be into Baltimore—might mean redirecting funds toward charter facility expenses or pushing harder to restrict collective bargaining. Maryland might also experience some of the financial strain that rapid charter growth in other states has placed on traditional schools. While the Baltimore City School District might need to work harder to collaborate with its local charter sector, and the teacher unions may need to re-examine some provisions within their contracts, it’s not yet clear that Maryland’s unique charter culture is headed out the door.